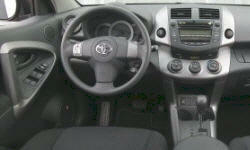 Toyota RAV4 Cargo Capacity Pros and Cons | Page 1 of 2 | Why Not This Car? 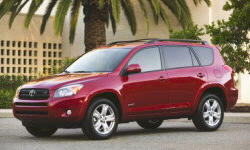 I'd say this is a great SUV, good mpg's, and of course Toyota quality! A good vehicle. Will pass on to my kids when buying next vehicle. It carries a lot of big things inside and on top. If you fold the back seats down and move the passenger seat all the forward, you get descent cargo space. This car has the most cargo room in the class with is very important to me being the father of two young children. With the V6, the RAV4 tows 3500lbs, which is only slightly above average for this class. However, the transmission & engine will make it easy to do 3500. Interior cargo capacity is excellent as well. Sufficient capacity for what I need. Lower hidden rear compartment is a good security measure. Easily tows my boat. Good cargo room. Vehicle much larger inside than it looks on outside. Rear seats fold flat easily, and low bumper height makes it easy to stow items. Roofracks add capacity, and V6 allows for towing. Vehicle wide enough not to bump elbows constantly. The 09 is larger than the previous generation. We had actually been looking at a used Highlander, and this is not much smaller. There is a large storage area UNDER the rear cargo floor, which doubles the space. Can haul a lot of stuff! Easily tows up to its rating of 3500 pounds. A LOT of room in a modest sized vehicle. Tows utility and small camper trailers with ease. With the V6 engine, it provides more towing capacity then any other car in its class. Lots of space inside given the size of the vehicle.